In watching the event, from the initial announcement of honorees through the luncheon itself and the promotion after, I marveled at the marketing value tied to it. In our age of two-working-parent households, millennial “philosophies” and societal changes in attitude toward who works in a family and how a company handles it, there is a lot to learn from this program. With increased pressure from corporate America to make sure your workforce is diverse, many law firms have found attracting viable candidates difficult. Again, looking at it purely through marketing eyes, you see the heavily promoted women’s initiatives, diversity efforts and paternity policies splashed across websites and brochures. The goal is twofold–to attract diverse lawyers and to show your corporate clients that you care about it. Reality, in some instances, might be another story. But, hey, if we do a good job marketing it…that’s not my problem. 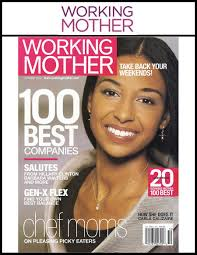 With the Working Mothers’ honor, my wife received recognition internally (promoted within J&J), externally (through PR) and everywhere from her school to friends and acquaintances on Facebook. I had the chance to put faces to names at the luncheon. She gets positive promotion that will ideally positively impact her career down the road. J&J gets positive promotion as a company that does not just sell products to Moms but creates an atmosphere and culture in the workplace conducive to working hard and successfully raising a family. The kids get to see Mom honored at a huge event (although skipping school was easily a benefit as well). The parents and in-laws get to attend. And the husband takes photos, smiles and writes a blog post about it. In recognizing work-life balance, everybody wins.